I hope you are in the best of health and Imaan. 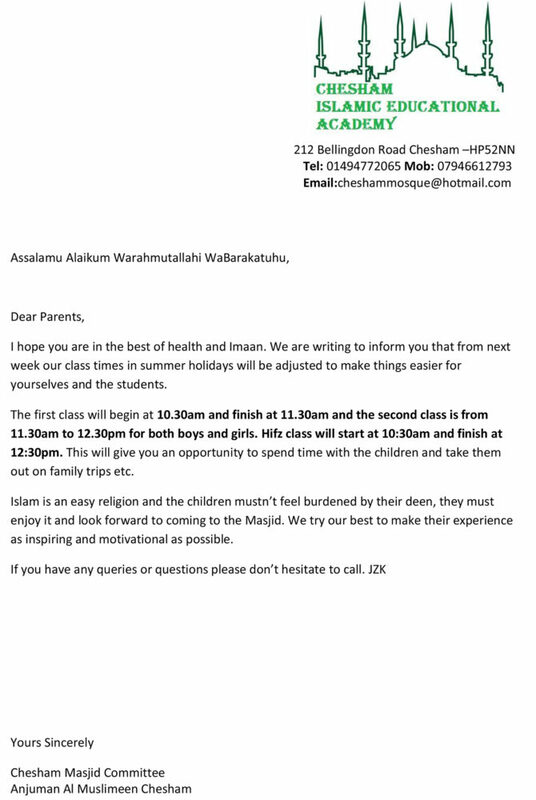 We are writing to inform you that from next week our class times in summer holidays will be adjusted to make things easier for yourselves and the students. The first class will begin at 10.30am and finish at 11.30am and the second class is from 11.30am to 12.30pm for both boys and girls. Hifz class will start at 11:00am and finish at 12:30pm. This will give you an opportunity to spend time with the children and take them out on family trips etc. Islam is an easy religion and the children mustn’t feel burdened by their deen, they must enjoy it and look forward to coming to the Masjid. We try our best to make their experience as inspiring and motivational as possible.